Margaret “Peg” Frances (Ryan) Weisker, age 92, passed away Sunday, December 9, 2018 surrounded by the comfort of her loving family. She was the daughter of the late William H. and Grace (Lombard) Ryan and the wife of the late Charles H. Weisker of Foxboro. Peg was born a Vermonter on April 12, 1926. 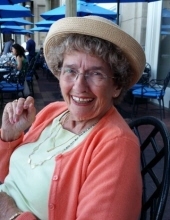 She was a graduate of Cathedral High School and Trinity College, both in Burlington, VT. "Senora” Weisker was a language teacher at Foxborough High School for many years. Upon retiring, her smiling face welcomed visitors to Mass Audubon’s Moose Hill in Sharon every week for decades. Peg was a long-time communicant of St. Mary’s Church in Foxborough and a member of the Catholic Daughters of America. She was an active member of the Embroiderers’ Guild of America as well. Peg loved spending time with her family and friends while charming anyone she met with her genuine smile and infectious laugh. She adored traveling the world and zipping around town in her red convertible, MYDREM. Beloved mother of Karl Weisker of Foxborough, Karen “Kay” Andberg and her husband Steven of Foxborough, Kristin Weisker and her husband Al Cuddeback of Pocasset, and Beth McCarty and her husband Timothy of Okinawa, Japan. Devoted “Gram” of Evan Weisker, Benjamin Langley, Jacob Langley, Katrin Hawkins, Krista Andberg, Kareena Griffin, Kyan McCarty and Casey McCarty. Doting great grandmother of Diana, Reed, Huck, Margaret and June. Dear sister of Elizabeth Ryan of Foxborough and the late James Ryan, Bernard Ryan and Edward Ryan. Relatives and friends are kindly invited to attend calling hours on Sunday, December 16 from 3 to 6 PM at the Roberts and Sons Funeral Home, 30 South Street, Foxborough. A Funeral Mass will be celebrated at 10 AM on Monday, December 17, 2018 at St. Mary’s Church, 58 Carpenter Street, Foxborough. For additional information please contact 508-543-5471. To send an on-line condolence please visit the funeral home web site at www.robertsandsonsfuneralhome.com. If you wish, donations in Peg’s memory may be made to St. Mary’s Church, 83 Central St, Foxborough, MA 02035 or to Alzheimer’s Association, 225 N. Michigan Ave., Fl. 17, Chicago, IL 60601 for their support during Charlie’s illness. "Email Address" would like to share the life celebration of Margaret "Peg" Weisker. Click on the "link" to go to share a favorite memory or leave a condolence message for the family.